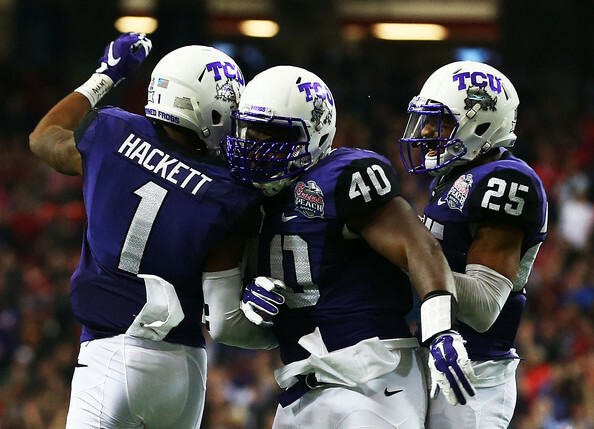 TCU and Baylor were the two teams who were “snubbed” out of the playoffs last season. I don’t put that word in quotation marks to suggest that I think it’s inappropriate, but the fact of the matter is that there were six teams who all had legitimate claims for being in a four-team playoff. Two teams were going to be left out. However, if the Horned Frogs (or the Bears for that matter) repeat the feat, well “Dubya” just told you how the saying goes. You could talk about any team and say that their quarterback is the most important player on their offense, and most of the time it would be tough to completely refute you even if there is a legitimate counter argument to be made. It is also true though that some quarterbacks are relatively more important than others for their respective teams. 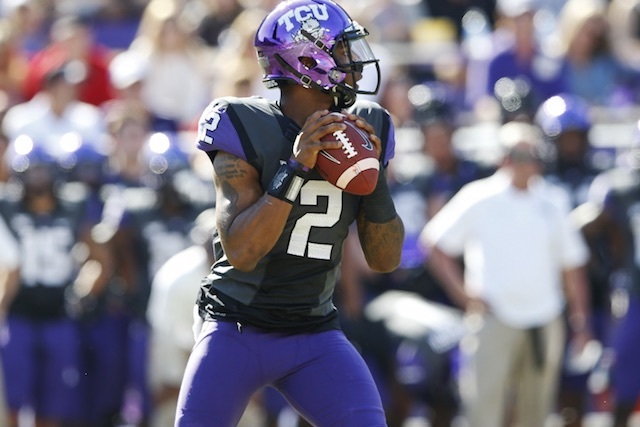 No quarterback will be more critical for his team’s success this season than Heisman favorite Trevone Boykin. Sometimes it can be a little concerning to rely on one player so much **cough Carmelo Anthony cough*, but this isn’t one of those times. 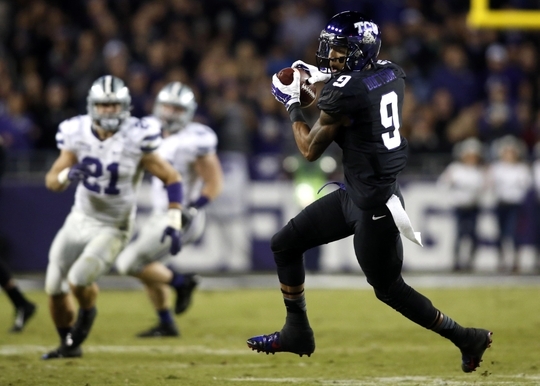 Boykin had a monster year in 2014, after a, shall we say, rocky start to his college career. He was less than a hundred yards away from 4,000 and threw 33 touchdowns and only ten interceptions. He also had over 800 rushing yards on non-sack carries and eight rushing touchdowns, and only lost one fumble, although luck did play a role in that because he put the ball on the ground a total of five times. The Horned Frogs also return a quartet of receivers who all went over 350 receiving yards and caught at least half of their targets, with the chief among them being Josh Doctson who topped the 1,000-yard mark last season. Kolby Listenbee and Deante’ Gary both got over halfway to 1,000, with Listenbee at 753 receiving yards and Gary right behind him at 582. Ty Slanina rounds out the starters at the Y-receiver position after catching 32 passes for 383 yards last season. Boykin will also have four returning starters on the offensive line to protect him this season, including a pair of second team all-conference performers in C Joey Hunt and LT Halapoulivaati Vaitai. Joseph Noteboom expects to be the only new starter on the line at right tackle, despite not starting a single game as a freshman last season. Jamelle Naff and Brady Foltz will play the two guard spots again in 2015, and have 28 career starts between them. Aaron Green’s numbers at running back may not immediately jump off the page at you, but when you factor in the running of Boykin and the offense’s run-pass splits, they are pretty impressive. Green came up just shy of 1,000 yards rushing with nine touchdowns, but he also did that on over seven yards per carry. That’s an astounding “ypc” for a starting running back. Sophomores Trevorris Johnson and Kyle Hicks should also add depth to the running game after combining for 462 rushing yards and four touchdowns, all by Johnson, last season. TCU’s defense was unfairly remembered as a group that melted down against Baylor and potentially cost their team a playoff spot, but the facts of the matter remain that they were a top twenty defense and top ten run defense even with that 61-point meltdown. They also showed a propensity to improve as games progressed, were stout on third down, and forced an astounding forty turnover. Now, everyone knows that turnovers and turnover margin have a lot to do with luck, but still if you force forty turnovers in 14 games you are probably doing something right too. When it comes to the defensive line, the Horned Frogs have an overabundance of potential playmakers returning to a line that was very good against the run last season. Four defensive ends could potentially start between James McFarland, Josh Carraway, Terell Lathan, and Mike Tuaua. McFarland and Tuaua were the most productive of the four last season combining for 58.5 tackles, 20.5 tackles for loss, twelve sacks and six forced fumbles. Carraway chipped in five tackles for loss and two sacks, and Lathan had ten tackles for loss and 4.5 sacks. Defensive tackle Davion Pierson should have a solid year no matter who is rushing the quarterbacks from the outside. He had eight tackles for loss and 3.5 sacks last season. If the post-spring depth chart holds he will be joined in the middle by sophomore Chris Bradley. TCU’s back seven is easily facing the most turnover heading into 2015 with both linebackers and three of the four leading tacklers in the secondary gone. Derrick Kindred is back after putting up 71 tackles, four interceptions and five pass break-ups last season. Ranthony Texada also returns to his corner spot where he picked off a pass and broke up seven more last season. Sophomore Torrance Mosley emerged from spring as the other starting corner alongside Texada. Denzel Johnson ought to start at strong safety, with either Kenny Iloka or redshirt freshman Ridwan Issahaku playing at weak safety. Johnson and Iloka are the most experienced of the group, with both combining for 28.5 tackles and a pass break-up last season. Depending on how empty or full you see the glass, you could either be encouraged or discouraged by the fact that Mike Freeze will be starting at middle linebacker as a true freshman. On the one hand, if he beat out older guys he must be pretty good, but on the other hand the only two guys who played at middle linebacker last season are gone, so there’s no way of knowing how good that actually is yet. Sammy Douglas is the leading returning tackler at linebacker and a safe bet to play strongside linebacker after recording 14.5 tackles and one sack last year. Baylor fans will probably be all over me for suggesting that TCU gets over them this year, but it seems like the most likely scenario to me too. TCU was a huge meltdown away from beating Baylor in Waco last season, not to take anything away from Baylor’s comeback but it’s still worth mentioning how close the Frogs were to winning that game. This year that game is in Fort Worth and on the last Saturday of the regular season, excluding the weekend reserved for the Army-Navy game. I have a feeling that a revenge-minded TCU might win that game, and so then the question is what about both getting in? That also seems highly improbably to me, especially considering that Baylor’s (or TCU’s if it goes the other way) last game before the committee convenes for the final time would be a loss. Recency bias shouldn’t play a role in the committee’s decision, but it borders on naiveté to believe that it won’t. History says that it does, and that was with a system that consisted mostly of computers.